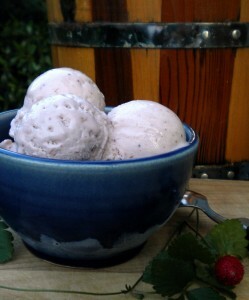 July is National Ice Cream Month and homemade ice cream is one of summer’s premium pleasures. As thermometers nationwide top 100 degrees, folks will be dipping into plenty of ice cream. When my grandmothers made ice cream I would sit on the porch watching the silver iced-packed cylinder go ‘round and ‘round in that wooden bucket as it was hand-cranked for what seemed like forever. Most often their flavor of choice was the rich, eggy vanilla, that Daddy called New York. My favorites were always the fruit-filled versions with strawberries and peaches flush with flavor. The flavors I choose have not changed but these days I try to make sure the fruit is from the farmer’s market and the peaches are from Alabama’s Chilton County. Making ice cream is not the chore it was back in the day. Today ice cream makers are a little fancier, may be counter-top, and are powered by electric current. Whether you opt for the counter-top appliance on the “hot” list or rely on the traditional wooden style that is likely to be fabricated from plastic, you’ll need fresh local fruits for deep flavor. Homemade ice cream takes a little patience—in the end you’ll agree it is worth the wait. Combine sugar, flour and salt in 3-qt. saucepan. Gradually stir in scalded milk. Cook over medium-low heat, stirring constantly until thickened. Simmer 3 to 4 minutes, stirring occasionally. Remove from heat. Gradually stir small amount of hot milk mixture into eggs. Gradually add egg mixture to saucepan. Cook stirring constantly until mixture almost simmers and coats the back of a spoon. Do Not Boil. Pour custard mixture into stainless steel bowl. Place bowl in ice bath, stirring to cool. Remove from ice bath and cover. Refrigerate several hours or overnight. Stir whipping cream, chilled fruit puree, and vanilla into mixture, mixing until blended. Pour mixture into chilled ice cream canister. Place canister in ice cream freezer; process according to manufacturer’s directions. YIELD: Approx. 1 quart. Process berries in blender or food processor with a metal blade to puree. Strain into 3-qt. saucepan. Cook, over medium-low heat, stirring frequently until mixture reduces by half (to 1 to 11/2 cups) Remove from heat, chill several hours or overnight. *Cut large berries in half.